If you drive BC, we want you to “know before you go” by making DriveBC a regular part of pre-trip planning. Whatever we can do to make using the traveller information system easier, we’re all for. That includes answering your questions. Q: How do you search for incidents or road conditions on DriveBC? A: There are three ways to search incidents and road conditions. Map View: You can zoom into the highway/route of interest to you, and click icons in the legend at the top right. This allows you to see the specific alerts you want along your chosen route. You can check road conditions, current planned events (Ie. road construction and special events), view conditions on the webams, and check current and forecasted weather. Conditions & Events Tab: This page shows conditions and events in simple text format. You also have the option to narrow down your search by route or district. Any incidents, planned construction and travelling information is posted on our site and can be found through each of these search options. Rather have the info come directly to you? You can subscribe to alerts for your specific area in three ways: Twitter, email alerts, and RSS feed. Q: Why doesn’t DriveBC have an app? A: The DriveBC team did extensive research before deciding to develop a mobile website in place of a mobile app. The main reason was the cost involved with developing and maintaining apps for each type of mobile device available on the market (iPhone, iPad, Android, Blackberry etc.). Technology is changing constantly, and the team would not be able to keep up with the demand and cost for apps as new mobile devices are constantly becoming available. Instead, the team opted to develop a mobile website, which is accessible from all mobile devices. Helpful tip: add the mobile site as an icon on your home screen so you can access it as easily as you would an app. Q: When I searched “Victoria” in Plan Your Route it brought me to Victoria in Australia. What’s up with that? A: The map interface you see on DriveBC and in the Plan Your Route feature is a Google Maps interface. DriveBC uses Google Maps to display provincial highway traveller information – the map itself is not under the control of the Ministry of Transportation and Infrastructure. Helpful tip: specify “BC” when entering “to” and “from” locations to avoid it searching globally. Q: How do you choose webcam locations? A: Selections are based on a variety of criteria, including safety considerations, cellular/network communications, proximity to hydro power, the location’s benefit to the travelling public and public demand. Q: I was involved in an incident that may have been caught on your webcam. Can I get the video footage? A: We only release images to police in an investigation. In these cases, we require the name of an attending Constable, their contact information and a case number. We then mail the images to them on a disk. The images are low-resolution to protect public privacy. We hold on to still images for two weeks before overwriting them. Q: What’s the easiest way to find the webcams I use most often? A: The MyCams feature saves the webcams you use most often in one area so you don’t have to continually keep searching for them. On the left-hand side of the home page you will find a link to BC Highway Webcams. In this link you will find a list of our webcams. Select the webcam you would like to save and you will see a small red plus button that states “Add to My Highway Cams.” The button is typically under the map beside the webcam image. Big thanks to everyone who uses DriveBC and takes the time to learn more. Don’t see your question here? Feel free to post in the comments section below, and we’ll get an answer for you. Why do some of the webcams have a red line at the bottom of the picture ? The red line appears when the last image that should have come through was not transmitted properly. The next image will usually transmit normally, but if it doesn’t, the red line will remain and a “Transmission Delayed” message will appear over the image. I have 1 complaint under major events why isn’t the 40min (f…..) delay on the east side of kòotenay pass listed. That is bullsit. I also have 2 concerns about the traffic control signs are too close to the job site.with the length of delays traffic is backed up well into the signage. Another concern I have is where are the ministry people that should be on site to monitor how the job is progressing or how much slow time there is. 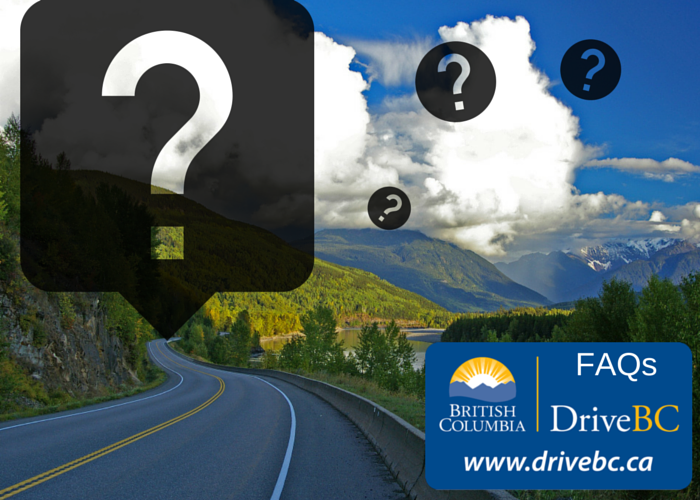 Thanks for connecting with us here.We have sent your question and concern directly to the DriveBC team for follow up. They should be responding to you soon. Our maintenance contractors closely monitor weather conditions and apply product when needed to keep travellers moving safely. Is there a stretch of road in particular you are concerned about? How do you add drivebc as a icon to a iPhone ? Good question! To add DriveBC to your iPhone, you will need to visit the DriveBC mobile site. Once you are there, add the website as a button on your home screen by selecting the action button at the bottom of the safari screen. Choose the action “Add to homescreen” and voila! Hope that this helps. We have All season tires on our vehicle, can we travel the Coquilla without M & S tires with chains? Have you looked for the logo on your tires? The majority of all season tires are M+S rated. If they don’t have the M+S or snowflake, you shouldn’t travel the Coquihalla, or any other mountain highway -even with chains. Hope that this helps. Please let us know if you have any other questions. What is the cost of taking the Usk Ferry and what is the route. The ferry is free of tolls, and runs on demand between 0615 and 2345 with some gaps in service. It carries a maximum of 2 cars and 12 passengers at a time. The crossing is about 150 metres (490 ft) in length, and takes 5–7 minutes. At times of low water, or ice in the river, the ferry is replaced by an aerial tramway that carries passengers only. Hope that this helps! Why no camera at intersection Salmon Arm/Vernon on the Trans Canada. I notice there is a lack of cameras in the Salmon Arm area Trans Canada versus Revelstoke which have 4 cameras showing the same area.How about one at Sicamous city. Thanks for the feedback. We have shared this with our webcam team, so stay tuned!